This popular Szechuan (Sichuan) Chinese dish, Mapo Tofu, is my family’s favourite. Actually, I love every dish that cooked with tofu (beancurd). 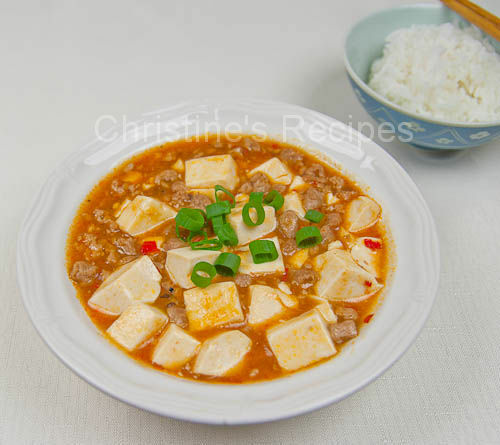 The dish is a combination of tofu, simmered in spicy chili- and bean-based sauce, together with pork mince or beef mince. That said, it was named for the old woman who invented the dish. As she got a pockmarked face, her popular dish was named as 麻婆豆腐, literally translated as "pockmarked grandmother’s beancurd". Generally, Szechuan cuisine is very hot indeed. I have to adjust and cook the tofu in mild-hot sauce. The authentic taste of Mapo tufu has to include the powdered Szechuan peppercorns that would give a unique spiciness, as a result of creating a very special effect of numbing and spicy (麻辣). The amount of powdered Szechuan peppercorns used in this recipe was very mild and suits to the taste of the majority. Yet you might like to roast or dry fry (fry on hot wok without any oil) the Szechuan peppercorns in order to bring up more flavour, and add more of it if you desire a stronger taste. Mix pork mince with marinade well and leave for 20 minutes. Fill a saucepan half full of cold water. Add 1 teaspoon of salt. Carefully, lower diced tofu and should be covered by cold water. Cook over medium-low heat. When it boils, turn off the heat and let tofu stay in hot water in order to absorb more salt and keep warm. Heat 2 tablespoons of oil in a wok over medium heat. Add pork and stir fry until lightly brown. Add minced garlic and minced ginger in the middle of wok and saute until aromatic. Sprinkle wine, add chili bean Sauce, chili sauce and combine well. When you smell the chili aroma, pour in chicken broth (or water) and bring it to a boil. Season with light soy sauce and sugar. Drain tofu with a big slotted spoon and carefully add into the chili sauce. Reduce heat to low and simmer for 5 minutes. The texture of tofu will be kept as smooth as silk if they are cooked on low heat. Occasionally, push the tofu and mixture around because you want to keep the tofu in good shape and mix all ingredients well. Try not to break the tofu anyway. Add 1/3 of the thickening into the tofu and sauce. When it boils again, add the other 1/3. Carefully combine well. When it boils again, add the last 1/3 of thickening and cook to your preferred consistency. Sprinkle Szechuan pepper powder. Stir well. Dish up, garnish with spring onion. You might like to use beef mince (ground beef) instead. Either pork mince or beef mince will do. The amount of chili bean sauce and chili sauce can be adjusted to suit your personal taste. To cook this dish is not difficult, yet care and patience might be yielded that the tofu is not torn apart while cooking with the sauce. The secret of cooking the tofu just right in texture is to put them in cold water with salt. Slowly bring up the heat. Once the water boils, turn off the heat. Don’t remove the tofu right away. Keep them in hot water for a while. Normally, in Chinese cooking, just add the thickening once and for all. But for this dish, it’s better to have thicker sauce. The key is to add the thickening at three times. At the end, the sauce will not be diluted or become watery later on. You might have noticed that I omitted the fermented black beans in this recipe. If you like it, you just rinse 1 teaspoon of them, then mash them to paste. Let it cook with chili bean Sauce and tofu. The sauce would be darker then. Yum, one of my husband's favorites when we dine at Chinese restaurants. I have yet to make it at home. Thanks for the recipe; I'll have to try it! I've never made a tofu soup before, but this sounds amazing. So flavourful, love the Szechuan peppers. I think I need to give this a go! Well, this is not soup, but with lots of sauce, going really well with Jasmine rice. Very tasty indeed. I'm not a big fan of semifirm tofu, but Christine - I trust you with your recipes so I am giving this a try - it sounds very tasty! If you don't like semifirm tofu, you can replace with the soft, silken one. For using the semifirm tofu in this recipe, just because it's much more easy to handle. I like Mapo Tofu. Spice and numbness yet so appetizing. A recipe so tasty I've bookmarked it twice! This sounds great! I love the spicy chili- and bean-based sauce, yum! This has to be one of my favourite dishes ever. I have made a Neil Perry version, but this looks great. I will have to try this next time. I wish I could dig into this right now! Thanks for sharing this recipe Christine! I have always wanted to make this dish but I thought that the only way was for me to buy a packet but reading the recipe I think I can handle it myself! Thanks for giving me the confidence to do so. What kind of chili-bean sauce and chili sauce do you use? We have several excellent Chinese markets in the area, but I'm not sure exactly what family of products you're referring to. Thanks!! I used the Lee Kum Kee chili-bean sauce. turned out great! the only change I made was leaving out the chili ingredients with the exception of chili bean sauce. Thanks! I tried this last evening, and my husband and I loved it! I put more chili into it than I'm used to, but it enhanced the flavour much more than I expected. Thank you for sharing! I made this for dinner tonight and it was delicious! Very simple but tasty. Thank you for the recipe. Is there an alternate or homemade recipe for the chili bean sauce/ chili sauce? Sorry, can't think of any alternative sauce. I just bought it from a local Asian grocer. Do you have any nearby? Thank you so much for sharing this. I've made this many times for my family and even my primary-school-aged daughters love it! So wonderful ! Glad that your daughters loved it.